The company has set its sights on achieving one million in annual sales by 2020. Suzuki Motorcycle India has crossed a significant milestone by rolling out its four millionth two-wheeler in India. The four millionth vehicle was rolled out of Suzuki’s facility in Gurugram, Haryana, which is also the company’s sole manufacturing plant in India. With this achievement, Suzuki has made further progress towards its stated aim of clocking one million in annual sales by 2020. For fiscal year 2018-19, the company plans to sell 7.5 lakh units. In the period between April to November 2018, Suzuki had sold a total of 4,93,329 units. With four months to go for the fiscal year to end, the company is well on its way to achieving the 7.5 lakh units target. The bikemaker also aims to double its market share of the Indian two-wheeler market by 2020. If Suzuki were to achieve that, it would break into the top five of the largest Indian two-wheeler makers. Suzuki’s share of the Indian two-wheeler market currently stands at less than 3 per cent, trails those of its fellow Japanese counterparts like Honda and Yamaha. Suzuki’s portfolio in India consists of a mix of premium commuter motorcycles, scooters and superbikes. The company had decided to exit the mass-market sub-150cc motorcycle segment last year. The Hayate is the only sub-150cc motorcycle to be still sold by Suzuki and will be made till 2020. Other products in Suzuki’s India line-up include the Access 125, the Burgman Street, the Gixxer series and the Intruder. It also assembles and retails a range of superbikes in India including the legendary Hayabusa, the GSX-R1000R, the GSX-S750, the RM-Z series and the V-Strom 650XT. New Delhi, December 5, 2018: Suzuki Motorcycle India Private Limited (SMIPL), a subsidiary of one of the world’s leading two-wheeler manufacturer, Suzuki Motor Corporation, Japan today added another feather to its cap as it rolled out four millionth vehicle from its plant at Gurugram, Haryana. The production milestone paves the way for SMIPL’s target of achieving one million volume sales and doubling its market share by 2020, in India. 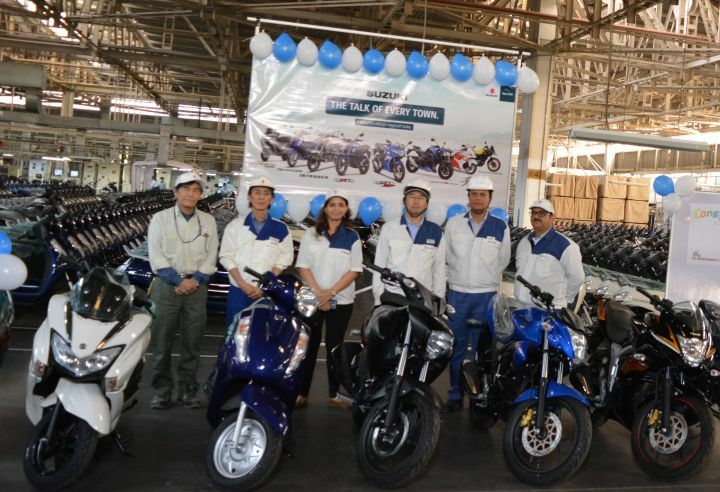 With 16 products under its portfolio, Suzuki Motorcycle India has won the customer’s trust with its popular scooters - Access125 & Burgman Street and motorcycles Gixxer series and Intruder. Along with 125cc scooters and 150cc motorcycles, Suzuki Motorcycle India also retails big bike in India comprising legendary Hayabusa, GSX-R1000R, GSX-S750, V-Strom 650XT and RM-Z series. Suzuki Motorcycle India also exports its ‘Made in India’ products to over 30 countries across the world. The company has achieved this feat in 12 years of operations in India, started in 2006. It has a pan India presence with 521 number of dealerships. Today, Suzuki Motorcycle India is one of the fastest growing two-wheeler companies in the country. As a brand, Suzuki embodies excitement, sportiness and the spirit of youthfulness. SMIPL is committed to create exciting and quality products across all segments. Suzuki products are durable, well-crafted and reliable, they are packed with performance and value, yet, has always included fun.